Where seen? These long stick-like fishes with pointed jaws are sometimes seen at low tide on some of our reef flats, especially at night. During the day, larger ones are sometimes seen at jetties. What are needlefishes? Needlefishes belong to the Family Belonidae. According to FishBase: the family has 10 genera and 34 species. Besides marine species, some species are found in freshwater. Features: 50cm-1m long or more, these fishes have a long silvery body. In some, the cross-section of the body is circular, in others rectangular. They have long, narrow pointed jaws that are beak- or needle-like, thus their common name. 'Belone' means 'needle' in Greek. These slender jaws are usually filled with sharp needle-like teeth. The jaws are shorter in juveniles, elongating as they age. Has one single dorsal fin. Like other fishes that live near the water surface, they are usually darker coloured from above, and silvery from below. Thus they are camouflaged from predators both above and below the water. They usually have a dark blue stripe along the body length, and the tip of the lower jaw may be red or orange. These fishes tend to skitter or make shallow leaps out at the water surface. They appear to be attracted to lights at night and there are stories of these fishes leaping into fishermen's boats at night. Occasionally, there are reports of people accidentally being killed by the spear-like jaws of these leaping fishes. Sometimes mistaken for halfbeaks. Halfbeaks are generally shorter and only their lower jaw is elongated while the upper jaw is very short. In needlefishes, both the upper and lower jaws are of equal length and usually filled with sharp teeth. Here's more on how to tell apart stick-like fishes commonly seen on our shores. What do they eat? These surface-dwelling fishes hunt small surface-dwelling fishes, catching these with a sideway movement of their jaws. They in turn are hunted by larger fishes including dolphins. Baby needlefishes: Their eggs have entangling tendrils so the eggs cling to one another or to objects in the water. Juveniles of some species shelter in mangroves, moving out to deeper waters when they mature. Human uses: In some places, they are caught for eating. Although the flesh is said to taste good, the fishes have many small bones which are green and thus appear rather unappetising. Photo shared by James Chua on facebook. Spot-tail Needlefish (Strongylura strongylura) and Banded/Slender Needlefish (Strongylura leiura) Lim, Kelvin and Jeffrey K Y Low, Guide to Common Marine Fishes of Singapore. Singapore Science Centre. 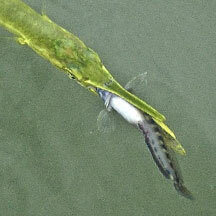 Spot-tail needlefish (Strongylura strongylura) Ng, Peter K. L. & N. Sivasothi, 1999. A Guide to the Mangroves of Singapore II (Animal Diversity). Singapore Science Centre. 168 pp. Family Belonidae (Needlefishes) and Platybelone argalus argalus (Keeltail needlefish) and Strongylura strongylura (Spottail needlefish) and Strongylura leiura (Banded needlefish) and Tylosurus crocodilus crocodilus (Hound needlefish) and Tylosurus acus melanotus (Keel-jawed needle fish) from FishBase: Technical fact sheet on the family. Vol. 4. Bony fishes part 2 (Mugilidae to Carangidae) FAO Species Identification Guide for Fishery Purposes The Living Marine Resources of the Western Central Pacific.